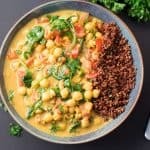 A satisfying and flavorful vegan curry dish, ready in 30 minutes! Heat the oil in a large saucepan, then add the onion and ginger. Cook over medium-high heat until softened (about 5 minutes), stirring frequently. Then add garlic and continue cooking for about 1 minute. Add the curry powder, mix well, and cook until fragrant (less than 1 minute). Add the tomatoes and their juices, coconut milk, and drained chickpeas; bring to a boil. Season with salt and pepper and simmer over medium-low heat until slightly thickened (about 20 minutes), stirring occasionally. Turn off heat and stir in the spinach, mixing until wilted. Transfer to a bowl, serve, and enjoy!